The Perhentian Islands, composed of Pulau Besar (besar = big) and Pulau Kecil (Pulau = Island, Kecil = small). I call it paradise Island because of the turquoise-blue water from the south china sea and the perfect white sand at longbeach on the small island. There are no streets, no high rises and no ATM´s on this beautiful Pulau at north Malaysia near Kota Baru. The tight jungle start direct where the beach ends and the coralreefs begin when you stay 5 meters in the warm clear sea. I was staying at Long Beach on Pulau Perhentian Kecil in the Lemon Grass Chalet. The beach is around 250 meter long and you can find some small guesthouses two small restaurants with local and western food. Spice Divers have a monopol here on this amazing beach in southeast Asia. The scuba diving is fantastic here! I saw nearly every dive sharks and turtles. 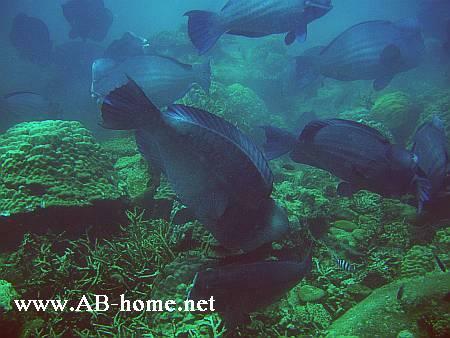 The highlight was a Humphead Parrotfish school at “The Iron Cape”. About 50 colosses up to 2 meters around, under and over me, amaizing! 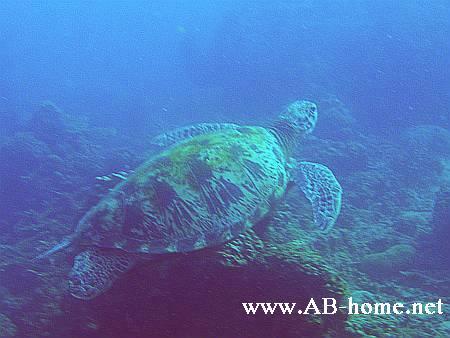 One dive with a 12L aluminium tank and full equitment was 80 Malaysian Ringit. From the beach the small boat can reach nearly every divesite in about 10 minutes and you go out every time for one scuba dive. Maximum time here by Spice Divers is one hour or 50 bar. 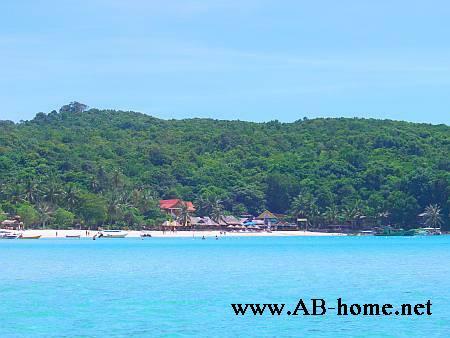 On Pulau Perhentian Kecil there are more or less just easy backpacker chalets. If you want to have more comfort Pulau Besar will offer you some options with international standart. I recomment the Lemon Grass Chalets or the small huts of Spice Divers. For more options look inside your Lonely Planet travelbook. The “Padi Golden Palm Resort” Spice Divers have beautiful beach terass where you can chill, hang around, meet people and of course book scuba diving for small money. A Padi Open Water Diver for example was 800 Ringit. The exelent dive sites are widespread. The “Sugar Wreck” offer good scuba wreckdiving and with “The Temple of the Sea” Perhentian have a great and intact multilevel reef for beginners and advanced divers. If you want to come to this beautiful part of southeast asia in Malaysia you can fly over Kuala Lumpur to Kota Baru. From the airport to the pier are driving minibuses. The ferry need about 1,5 hours till you arived in paradise. With small taxi boats you can visit other beaches for example to watch small seaturtles by the first challenge of their live. The run to the sea is dangerous for the baby turtles because the seabirds wait allready for this nature spectacle. On Perhentian Islands you can find what you eccept of total beach life, allday you will meet every traveler at least two times. 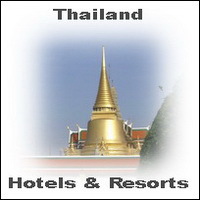 You will meet people easy for play beach volleyball, go for dinner or dive with tham. This islands of Malaysia are a tropical dream, take some books and visit Pulau Kecil. The best way to enjoy this marine nationalpark: let your watch and mobile on the mainland and relax on this white beach in a heangmatte direct on the south china sea. The fee for the “Taman Laut Malaysia” (Marine Park) was 5 malay ringit witch is abaut 1,5 US. 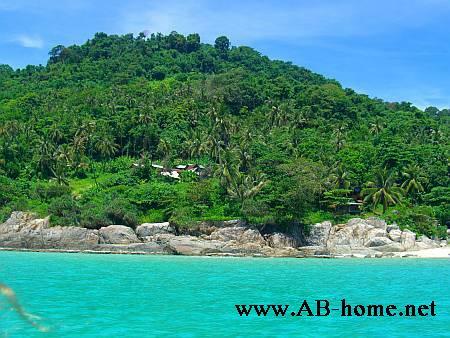 My result for Perhentian Islands: A “must to go” for all travelers and backpackers in Malaysia and south Thailand. I never saw something like that before, just amaizing! I hope the goverment take care of this perl of Asia to keep the spirit on this beautie small island. This archipelo should be perfect for honeymoon, dive holidays or to come down while traveling. On this trip my Lonely Planet travelguide southeast Asia was my follower and give me good tips where to stay and what to watch in this great islam country.